This mushroom is from family of Agaricaceae, is a edible mushroom (only when is cooked). 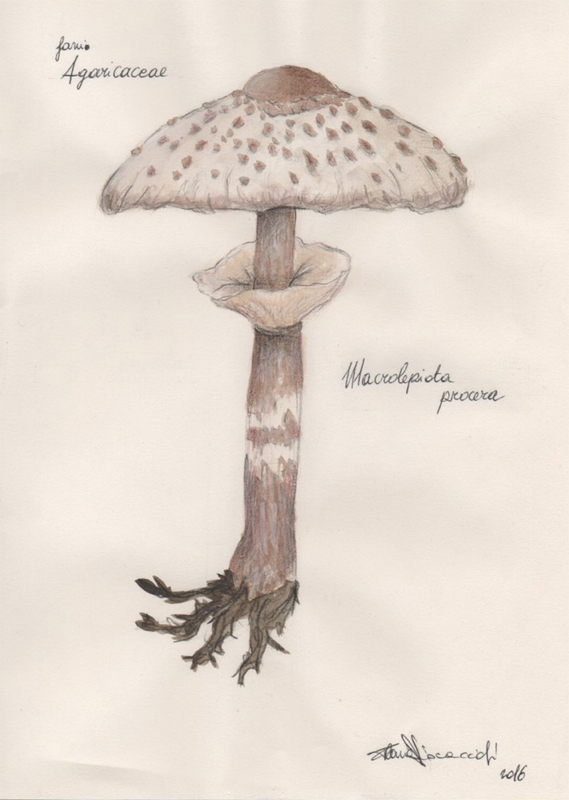 This mushroom lives often gregarious either in deciduous or coniferous, as in the meadows, in clearings and on roadsides. It is widespread in North America and Europe. Appear from summer to autumn. The hat is initially spherical, then convex and flat at maturity; has umbone brown or brownish-gray, smooth in the middle and then covered with flocculent and brownish scales with characteristic radial arrangement, more and more sparse towards the edge that looks frayed. The cuticle is hazel-whitish, fibrillose and silky. Ranging in size from 10 to even 25 cm.The slats are dense, numerous, irregular, white or yellowish color, then pinkish-brown color or powder and imbrunenti touch. Ventricose and high, show a clear separation from the stem. The stem is very thin (20-45 cm x 10-20 mm), normally right diameter, fibrous, tough, hollow cylindrical. Bulbous foot, is adorned with a double ring, smooth and wide. Below the ring is has the characteristic and obvious shingling colored milky coffee.